West Indies 7-159 (Kieron Pollard 46*, Lendl Simmons 41, Tinotenda Mutombodzi 2-28) beat Zimbabwe 6-117 (Hamilton Masakdza 53, Craig Ervine 15, Samuel Badree 3-17) by 41 runs. The T20, World Champions, West Indies, maintained their supremacy against the minnows Zimbabwe in the second consistent match and secured the series 2-0. The Windies smashed 159 runs with three wickets still in hand in the measured quota of 20 overs and Zimbabwe scored 117 for the loss of six wickets. 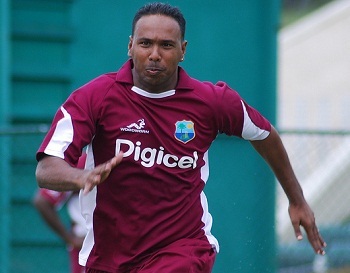 Samuel Badree (West Indies) was declared ‘Player of the match’ for his excellent bowling spell of 3-17. The second and final Twenty20 of the series was played on Sunday, March 3, 2013, at Sir Vivian Richards Stadium, North Sound, Antigua. Earlier, Darren Sammy, the captain of West Indies, won the toss, liked to bat first and lost an early wicket when Johnson Charles was gone for 10 runs. Dwayne Bravo got together with Lendl Simmons who hit the first six of the innings on the first ball of the sixth over that produced 16 runs with a four from Bravo. They kept on creeping and reached 61 in 9.2 overs as Dwayne Bravo was caught behind by the Zimbabwe skipper, Brendan Taylor off Natsai M’shangwe for 25. Simmons carried on with a couple of boundaries before he became the fourth victim at 92 in 14 overs after contributing 41 off 39 balls with 2 big sixes and 1 four. Kieron Pollard and Darren Sammy tried to stabilise the innings and the first hundred of the innings appeared on board in the 16th over which resulted in 12 runs with one six from Sammy. Pollard punished Tendai Chatara for 21 runs in the 18th over with 2 huge sixes and even fours. Darren Sammy was caught by Vusi Sibanda off Tinotenda Mutombodzi for 19 from just 12 deliveries with 1 six and 2 fours. Andre Russell and Denesh Ramdin went back to the pavilion without troubling the scorers as Kieron Pollard remained unbeaten for 46 off 24 deliveries comprising 3 lofty sixes and 3 fours. West Indies scored 159 runs for the loss of seven wickets at the end of the allotted 20 overs. Natsai M’shangwe and Tinotenda Mutombodzi were the top wicket takers with two wickets each whereas Chris Mpofu, Tendai Chatara and Prosper Utseya got one wicket each. Zimbabwe started their reply with Chamu Chibhabha along with Vusi Sibanda and the first hit two fours in the opening overs but was clean bowled by Samuel Badree for 13 runs. Sibanda was unable to negotiate with Badree and was caught by Bravo at point for just five runs. Brendan Taylor became the third victim of Samuel Badree after scoring four runs and the visitors were reeling at 3-33 in 7.2 overs. Hamilton Masakadza and Craig Ervine associated in the park as the score touched the 50 runs mark in the 10th over. The partnership was extended to 68 in 12.5 overs when Ervine was caught and bowled by Dwayne Bravo for 15 runs. Malcolm Waller came in next as Masakadza added 2 fours in the 15th over as the pair enhanced the score to 91 in 16.1 overs. Waller was run out at that point for seven runs and Hamilton Masakadza dispatched his sixth T20 fifty in the 19th over by sending the ball out of the fence twice. He secured his end for 53 off 51 balls with 6 fours as Zimbabwe managed 117 with four wickets in hand in 20 overs. Samuel Badree was the supreme bowler with three wickets and Dwayne Bravo held two. West Indies won the T20 comprehensively with a sufficient margin of 41 runs and clinched the two match series 2-0.